The Brilliant Waltz, commissioned by Teatro Regio of Parma, is an art installation to celebrate Giuseppe Verdi’s musical genius on the occasion of the recent Festival Verdi. 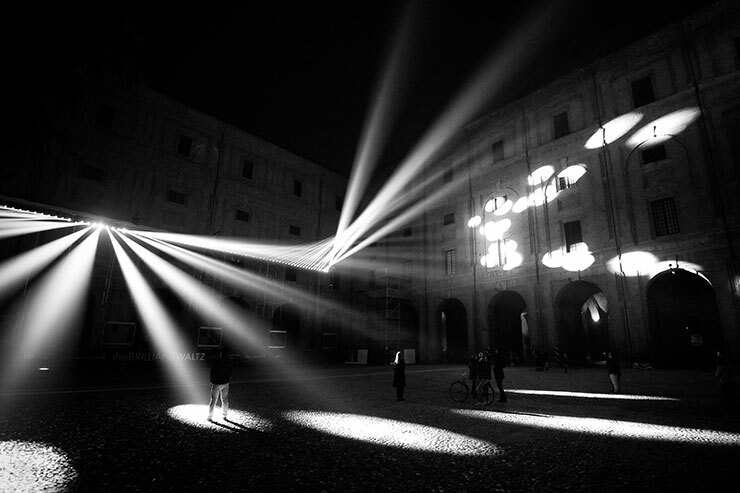 The result was a lighting installation concept and idea created by C999 artist and lighting designer, Luca Carapezzi. 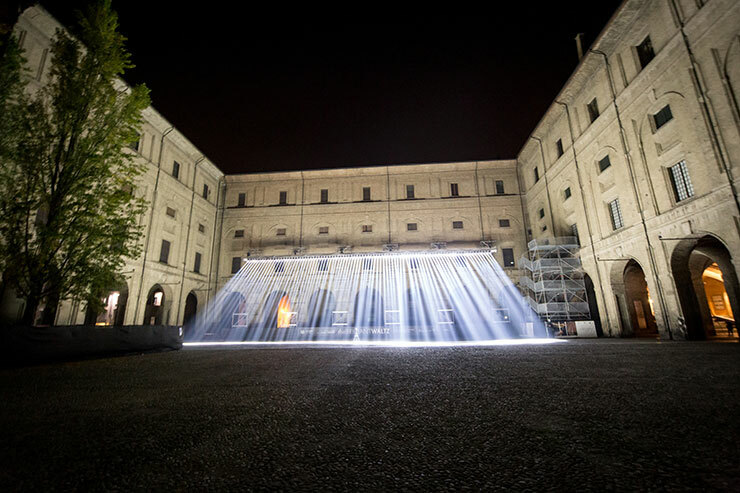 The work was devised to entertain the large local audience and numerous visitors who regularly invade Parma during the period of the international festival. It was designed to meet a precise request from the organizers: to capture public attention and reflect the beauty and grandeur of Verdi through a monumental work of public art. 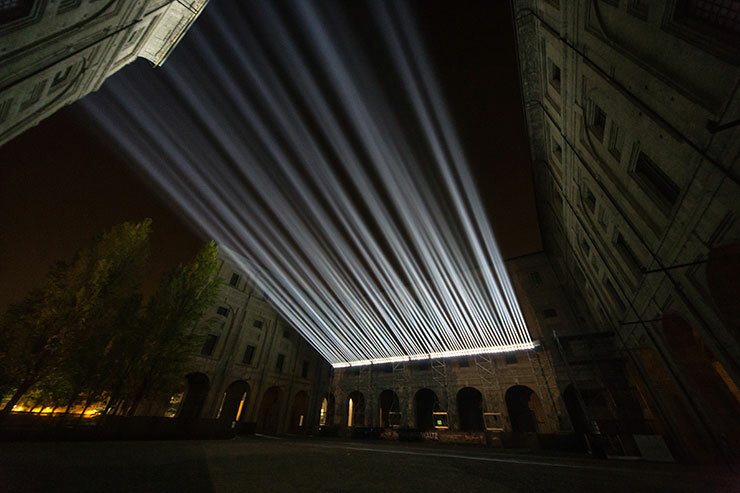 Brilliant Waltz played with light: moving heads beamed out to illuminate a historical court and cut through the city sky to the notes of Verdi’s famous brilliant waltz. This piece of music has become one of the best-known compositions of its kind thanks to Nino Rota, who orchestrated it for the film “The Leopard” by Luchino Visconti. The notes filled the air as the lights recalled the dance steps. Six fifty-foot tall towers were erected, recorded music was played throughout the square, and an exceptional number of moving heads were arranged in a line on a single fifty-yard-long truss, placed fifty feet above the ground. The whole installation revolved around the choice of using 88 small moving heads lightweight beam units. The concept behind the work was very simple and elegant: each light was used as if it were the weighted key of a piano. Each one corresponded to a note or a specific movement on the piano keyboard. There were no strings or hammers to make the notes and play the seven octaves covered by the black and white keys; there were only the beams and spectacular aerial effects of lights. 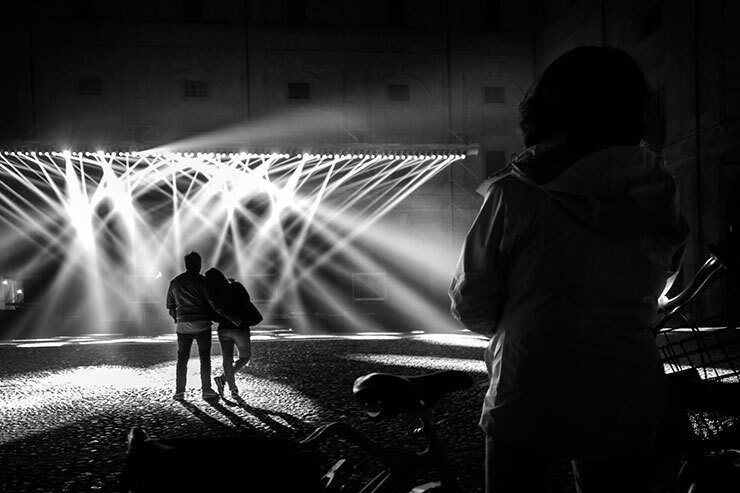 Each light moved in perfect synchrony with the musical score. The luminaires played the whole tones, sharps and flats in musical and visual sequences and virtuosities. 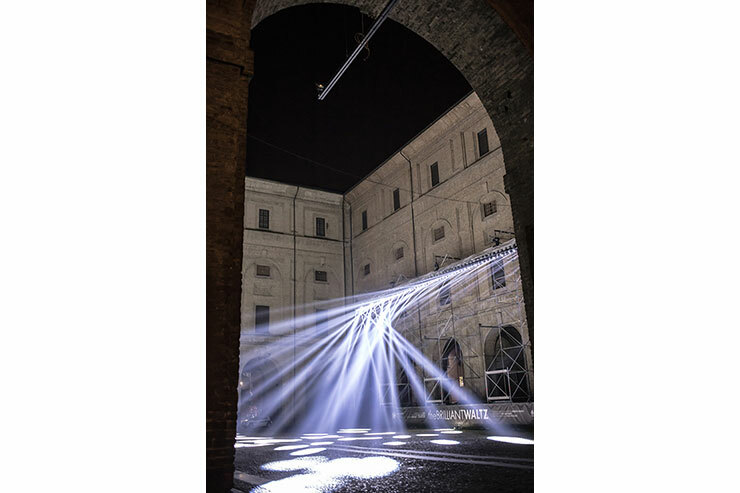 Lighting designer Luca Carapezzi transformed the visual art concept into a lighting design project. He established the specific requirements of the rig and programmed all the movements and effects chosen through sequences and dynamic variations, which were sometimes slow and elegant and sometimes energetic and spectacular. Thanks to a full keyboard of moving lights and an elegant light design, it was possible to give a masterful interpretation of the maestro’s piece. 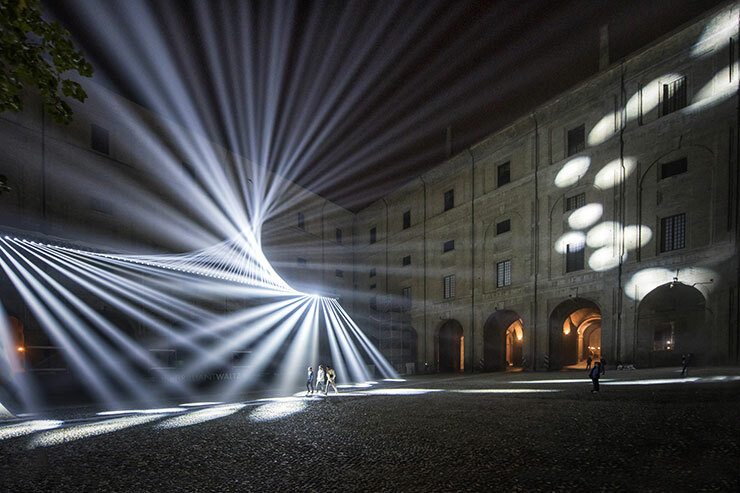 Each light was turned on as a single note to create absorbing, stimulating atmospheres or simply let the power of the lights flow out to fill the entire Cortile della Pilotta, the square chosen to host the installation. The lights beam created the dimension and excitement of a magnificent ballroom.